It was morning when we reached the North Pole, though the light was little changed from the night before. Bundled in identical expedition-issue red parkas, ninety-six of us shuffled impatiently as a gangplank was lowered alongside the Yamal. We then made our way down and stepped off the icebreaker onto the ice. From a great height it must have made for quite a sight: our ship leaking rivulets of red that quickly spread across the white sheet of ice like an ink stain. A crewmember had ­planted a large red pole in the ice some fifty yards off the bow of the ship. The sign read north pole. A line quickly formed to have a picture taken with the pole. Six months before, Mom had called asking if I would like to go with her to the North Pole. That I was any­thing less than resolute in an­swering stemmed, in no small part, from not being entirely certain what there is at the North Pole that you can actually visit. Long a world traveler, Mom recently was taking progressively ambitious and worry-making trips. Four years prior, my older brother, James, had undertaken a similar trip with her to Antarctica. It was a trip that completed her first lap of the seven continents and that convinced him to never again leave his apartment. Though hemispheres apart, James and I had a similarly rough go of it that winter. While he was infirm and icebound in Antarctica, I was wintering in an off-the-grid, uninsulated 1830s Vermont farmhouse. Construction on the adjacent build­ing that was to provide a warm and well-lit home for the winter had slowed to a crawl. In late November, as the first snow began to fall, I stood staring up the hill at the shell of a building and thinking about the Donner party. There was a comforting, albeit primitive, routine to my days. The wind through the wall blowing out my bedside candle meant it was time to go to bed. When the glass of water by my bedside had frozen solid, it was time to get up. Battling depression and chronic bronchitis, I sustained myself on bourbon and books read by gaslight. My favorite story was Eudora Welty’s “The Whistle,” whose middle-aged heroine, having laid her only dress over her freezing tomato plants, sits naked and silent as her husband splinters and burns the last of their furniture. Reading on, I learned that what I had long taken for granted as being the North Pole is merely a North Pole. It turns out there are, in fact, many North Poles (no fewer than three of which I began to wish we were going to instead). 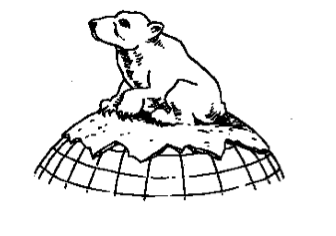 Aside from the most commonly sought pole—North Pole, Alaska, “City Where the Spirit of Christmas Lives Year-Round”—there’s the Geographic North Pole (this is where all of the earth’s longitudinal lines converge; also known as True North or latitude 90° North, it is a fixed point and lies in the Arctic Ocean), the Magnetic North Pole (this is where your compass points and is about a thousand miles south of the Geographic North Pole), the Geo­magnetic North Pole (the northern end of the axis of the earth’s magnetosphere),3 the Celestial North Pole (draw a line through the earth’s axis and keep going up), the North Pole of Inaccessibility (the point in the Arctic Ocean farthest from land on all sides), the Instantaneous North Pole (the point where the earth’s axis meets the surface; the earth wobbles as it turns on its axis, so this pole moves in an irregular ­circle known as the Chandler ­Circle), and the North Pole of Balance (the center of the Chandler Circle; a quick heads up: every year this point moves six inches toward North America). It’s also worth noting that there are peri­odic flips in the earth’s polarity, meaning that the poles actually switch places—the North Pole becomes the South Pole and the South Pole becomes the North Pole. The last such switch occurred about 780,000 years ago. Their methods were audacious, frequently insane, and yielded mixed results. In 1869, following the implosion of their icebound ship, a German expedition drifted for six hundred miles on a gradually diminishing ice floe, burning their books about previous Arctic expeditions for warmth. The aforementioned Norwegian ex­plorer Fridtjof Nansen’s strategy for reaching the pole, as described in his 1897 narrative Farthest North, involved a ship whose reinforced triple hull was designed not to break through the ice, but to resist being crushed under its tremendous pressure. Once frozen into the ice, his theory went, the prevailing currents would take an icebound ship to the North Pole, eventually depositing it near Greenland. Two years into the journey, realizing that they were still well south of the pole, Nansen and a companion jumped ship with food for one hundred days and continued north by dogsled. They did so knowing that their ship would continue its drift and would most likely not be found again. Making it within two hundred sixty-one miles of the pole, they set a new record for farthest north. With all of this in mind, it is worth qualifying the nature of my achievement. The home of Russia’s fleet of nuclear icebreakers is the city of Murmansk, located on the northern shore of the Kola Peninsula some twenty miles from the Barents Sea. The atomic icebreaker Yamal (a term originating from the nomadic, reindeer-herding Nenet people’s word meaning “end of the earth”) is one of five Arktika-class icebreakers currently under lease by the Murmansk shipping company from the Russian government. While its original purpose was to keep open Russia’s Northern Sea Route during the long polar night, it has found a lucrative sideline business contracting with ex­pedition tour companies. Painted fire-engine red, the 490-foot Yamal resembles a giant toy, albeit one powered by two pressurized-water OK-900A nuclear reactors, each containing more than 150 kg of enriched uranium-235 fuel rods and encased in 160-ton steel, water, and high-density concrete. With seventy-five thousand horsepower of pro­pulsion and an outer hull of 48-mm-thick argon-welded steel armor, the Yamal is the one of the most powerful vessels of its kind, able to navigate through ice 17 feet thick. Yet like a muscle-bound bodybuilder, there is a point at which the Yamal’s own strength begins to work against it. Its reactor cooling system requires the steady induction of very cold water, and thus, in spite of its abilities, the Yamal is confined to the northern polar seas. A trip to Antarctica, for example, requiring travel through warm equatorial waters, is impos­sible. Designed as a working icebreaker, the Yamal makes few concessions to the tourist class. Its interior design resembles the product of someone both astigmatic and angry. The condiment-colored, in­explicably contoured furniture could fortify a beachhead against attack. Mom and I shared a cabin that, had it led anywhere, would more traditionally be thought of as a corridor. I slept on the sofa and Mom in the bunk, the main advantage of which was a lip that kept her from being hurled to the floor while the ship was crashing through the ice. Equally advantageous were the blackout curtains that wrapped around her bunk, allowing an approximation of night against the otherwise unrelenting daylight of the Arctic summer. The handful of onboard am­en­ities (tiny pool, steam room, and world-class array of medicine balls) serves as an unsettling reminder of ongoing efforts at keeping the crew from becoming surly and mutinous during the long polar night. Further discomfiting is the pool’s proximity to the reactor core, making its uterine warmth somewhat suspect. A bulletin board in the lounge keeps a running tally of Arctic bird sightings: Pectoral Sandpiper, Glaucous Gull, Ruddy Turnstone, Northern Phalarope, Gyrfalcon, Pied Wag­tail, Pintail Snipe, Temminck’s Stint, Parasitic Jaeger, Long-billed Dowitcher, Rough-legged Hawk. Walls are adorned with large framed photographs of the Yamal itself and of passengers from previous expeditions celebrating their achievement. These photos seem put there less as evidence of past triumphs than as prompts, reminding you of just where you are and what you are doing. Their purpose, like that of labels found in the apartments of people with certain brain injuries (little notes like “refrigerator” or “cat”), is not entirely unwarranted. The polar environment is so wanting in ordinary contextual cues that maintaining a handle on your wits presents a real and constant challenge. Traveling as we were in the summer months, there was nonstop daylight. The sun, instead of re­liably rising and setting, nests in the sky, hardly moving. Watches and clocks, otherwise quite useful in such situations, become almost useless, for as longitudinal lines converge at the poles, so do time zones. Take five seconds to walk a tight circle around the geographic pole and you have traveled through every time zone on earth. Thus, when traveling even marginally east or west at very high latitudes, the time of day becomes rather fluid. This presents a real problem for scientists and other semi­permanent residents of the far polar regions, one that is often dealt with by picking the time of your home base, and never deviating from it no matter where you are. In our case, a helpful voice from the intercom announced each day whether to advance or rewind our clocks at bedtime. The landscape, too, is a dubious means of getting your bearings. Located in the middle of a vast frozen ocean, the North Pole is a world without proper ­three-dimensional topography. I would often stare out our porthole at our surroundings in the way I imagine a stick figure drawn on a piece of paper might behold its world. My ability to apprehend the ways in which this new lifestyle was wearing on my mind dimmed with each passing day, making it progressively harder to defend against. It is a cognitive degeneration akin to Alz­heimer’s, yet instead of the incremental loss of names for familiar objects, people, and places, you progressively lose the things themselves (landscape, time of day, night). It is an erosion that begins not in the mind (though this is its terminus), but in the very world around you as external points of reference and stimuli disappear. Amazingly, my mother seemed to suffer none of these effects, something I would credit to her thirty-five-plus years as a mental health professional and a keen interest in seabirds of the Arctic. Unlike a climber cresting the sum­mit of a mountain, when you reach the North Pole you have arrived at a place indistinguishable from any other for miles around. It is a place so lacking in actual thereness that reaching it becomes as much a feat of imagination as anything else. To attain it you must believe; believe not that you can get there, but that there is, in fact, a there to get to. That you might board the Yamal an unbeliever is not necessarily a liability. Zegrahm & Eco provides a bullpen of ­kindly and knowledgeable scholars, historians, and scientists whose charge is to help establish and maintain the dramatic narrative thread that would draw us inexorably toward the expedition’s center of gravity. Twice daily we all dutifully filed into the ship’s lecture hall for talks on polar history, climate, topography, flora, and fauna, all punctuated by spirited re­minders of our place in the pantheon of polar exploration. Their task was made immeasurably easier by the fact that as time wore on we became a highly suggestible lot. The circumstances of detention are ar­ranged to enhance within the subject his feelings of being cut off from the known and the reassuring, and of being plunged into the strange… The point is that man’s sense of identity depends upon a continuity in his surroundings… Little is known about the duration of confinement calculated to make a subject shift from anxiety, coupled with a desire for sensory stimuli and human companionship, to a passive, apathetic acceptance of isolation and an ultimate pleasure in this negative state. The symptoms most commonly produced by isolation are superstition, intense love of any other living thing, perceiving inanimate objects as alive, hallucinations, and delusions. The ap­parent reason for these effects is that a person cut off from ex­ternal stimuli turns his awareness inward, upon himself, and then projects the contents of his own unconscious outwards, so that he endows his faceless environment with his own attributes, fears, and forgotten memories. Many of these techniques were based on the research of John C. Lilly, the scientist and psychoanalyst whose lifelong exploration of the outer limits of the human experience led to famous experiments in­volving sensory deprivation tanks, dolphin-human communication, and LSD. Lilly, in turn, based his research on a study of eighteen autobiographical accounts of polar ex­plorers and solitary seafarers. By the morning of our ar­rival at the North Pole I had spent sufficient time with the photographs hanging in the lounge that I knew something of what to expect from the day. One of the more prominent photographs was of what I had come to think of and fear as the “maypole moment.” This “pole day” ritual involves a forty-foot maypole set in the ice alongside the Yamal. The pole is decked out with colorful rib­bons and flags of the world, around which we would all hold hands and complete the traditional circumnavigation of the earth. My plan, thought out days in advance, was to work my way un­seen to the opposite side of the Yamal, thus putting a good 250 feet and one hundred tons of argon-welded steel between me and the ceremony. Once on the ice, though, with so little in the way of landscape, activities, or attractions, I be­came ut­terly transfixed by the sight of our ship and simply stared back dumbly at the Yamal like an astronaut at the Earth. I was thus taken very much by surprise by the gloved hand that gently took mine and began leading me toward the circle assembling around the maypole. My immediate instinct—to shove my fellow passenger to the ground and run—seemed, in light of my ­mother being nearby, unwise. Someone now took my other hand and the circle began to close. The Yamal’s captain appeared and bid us welcome to the most remote place on earth. Of the fourteen thousand people to ever reach the North Pole, he informed us, seven thousand had done so by ship, and fewer than five thousand had ever stood where we now did. (Quite frankly, this seemed like a lot.) Upon the completion of his opening remarks, the circle began to turn and the United States national anthem blared from the ship’s loudspeaker. This for me is where things be­gan to pretty much fall apart. I had spent months reading the ­stories of men who had died for the slim hope of standing where I now did. I scan­ned the hundred-plus pas­sengers and staff around the may­pole, and the twenty or so crew­members preparing an on-ice barbecue of pork chops and french fries. Reaching the North Pole to find it packed with tourists is like arriving at a Tibetan monastery and finding it filled with Shriners. We had spent the last week in the lecture hall learning to believe in the North Pole and all its historical, geographical, and ecological significance. And now, out on the ice, I was suffering a crisis of belief, a failure of imagination. I no longer believed in, much less cared, where I was. 2. From the introduction to Fridtjof Nansen’s Farthest North. 3. Not to be needlessly irritating, but the Magnetic North Pole and Geomagnetic North Pole are actually considered to be south magnetic poles. As you no doubt know, the opposite ends of a magnet are those attracted to one another, thus the magnetic force that draws your compass to the north is actually its opposite, or south. Also, these are not fixed points and tend to wander. The MNP can currently be found near Ellef Ringnes Island in the Canadian Arctic, while the GNP presently resides just north of Thule, Greenland. 4. Failure being a frequent euphemism for death. 5. Fergus Fleming’s Ninety Degrees North. 8. KUBARK being a cryptonym for the CIA itself. Scott Browning is director of Hall Farm Center in Townshend, Vermont.